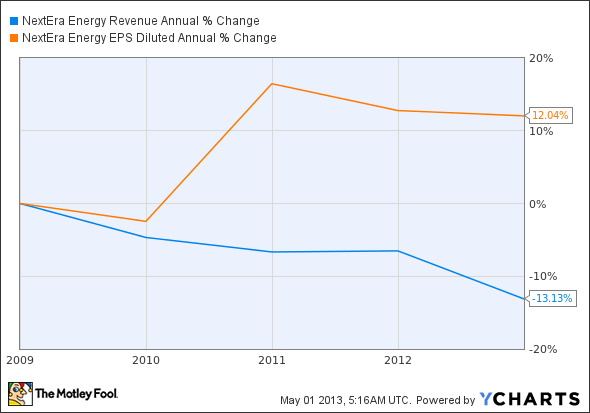 NextEra Earnings: Can Renewables Rock This Dividend Stock? The company is focusing its strategy – for better or worse. NextEra Energy (NYSE:NEE) reported earnings on Tuesday, underwhelming on revenue but exceeding on earnings expectations. As the largest renewable energy utility in the U.S., let's see if NextEra's newest report will put more wind in its sales. Sales clocked in at $3.3 billion, 2.7% below Q1 2012's revenue and 7.6% less than analysts expected. But even as the company's top line tumbled, it managed to make the most of bottom-line earnings: $475 million in adjusted net income translated to adjusted EPS of $1.12 for investors. That's a full 10% above 2012's first quarter and 10% above analyst estimates for this quarter's adjusted EPS. For a peck of perspective, NextEra sales have increased 12% over the last five years, while adjusted EPS has managed a near-mirror image 13% drop. Florida Power & Light, NextEra's regulated utility, packed the most punch for this quarter's profits. Adjusted EPS bumped up a seasonally adjusted $0.10 to $0.68, accounting for the entirety of its parent company's growth. With an enviable 11% ROE, regulated utility earnings continue to prove a cash cow for NextEra. TECO Energy (UNKNOWN:TE.DL) also operates a Florida regulated utility, Tampa Electric, but its expectations of sub-9% ROE for 2013 don't offer the same earnings NextEra enjoys. On the generation front, NextEra continues to push forward with solar and wind investments as it exits hydro and oil. The company kicked the can on its last hydro assets in March, and announced during its earnings call that it will take a $41 million hit to sell its 796 MW of merchant oil-fired assets in Maine. Oil continues to prove less and less useful for generation as prices head higher, and hydro represents a calculated decision to focus its energy portfolio elsewhere. PPL (NYSE:PPL) announced this week that it has successfully completed a $209 million hydroelectric expansion project, increasing output 70% to 60 MW. A major backlog has NextEra poised to add on 175 MW of U.S. wind power, 600 MW of Canadian wind, and around 900 MW solar, with incremental opportunities to add on even more. With wind production tax credits and investment tax credits for solar, renewables are becoming a significant energy source for many expanding utilities. Atlantic Power (NYSE:AT) is counting on renewables (and natural gas) to push its profits out of the red. The company's CEO noted in its Q4 2012 report that it is "likely to allocate more effort to wind prospects in the near term." Southern Company (NYSE:SO) is rapidly revamping its traditional portfolio. In the last two weeks, the utility announced 250 MW of new wind power purchases and an acquisition of a 139 MW solar farm from First Solar. With a solid regulated utility and an increasingly renewables-oriented energy portfolio, NextEra offers investors a unique mix of sustainable income with growth potential. Its stock is hovering at all-time highs, but I believe it still has room to grow. However, as NextEra "focuses its strategy," the utility will inherently lose energy diversity and increase its risk. A shift in regulatory winds could send this stock soaring or stumbling, and the same can be said for relative energy prices. I'll be keeping a close watch on NextEra over the next year and am looking forward to seeing where this utility ends up.